Right to Information commonly known as RTI basically give citizens the right to access information that is held by or under the control of any public authority. 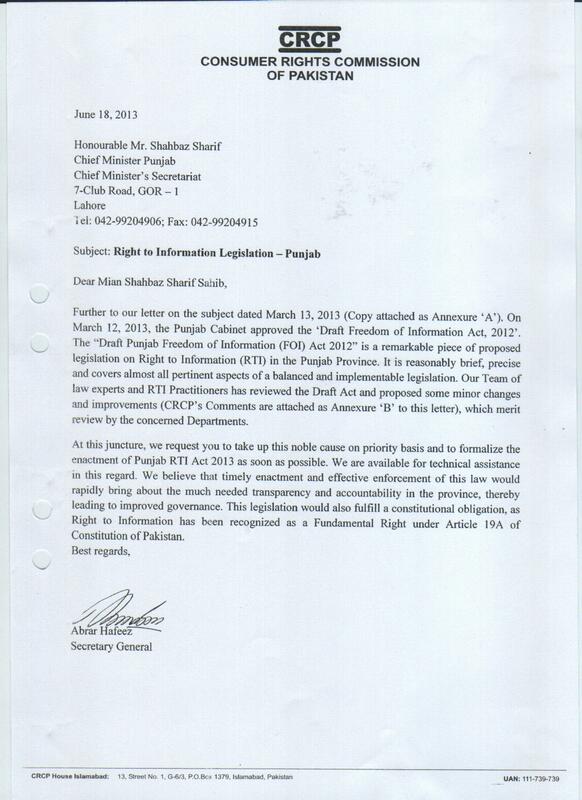 RTI law simply allows citizens to access public records of government-held information. By doing so, they are able to monitor the work of government bodies and contribute to their transparency and accountability. It is not coincidental that countries perceived to have the most corrupt governments also have the lowest levels of development or that countries with access to information laws are also perceived to be the least corrupt. In 2012, of the ten countries scoring best in Transparency International’s annual Corruption Perceptions Index nine countries have effective legislation enabling the public to see government files. The same list also indicate bottom ten countries perceived to be the worst in terms of corruption, not even one country has a functioning access to information regime. 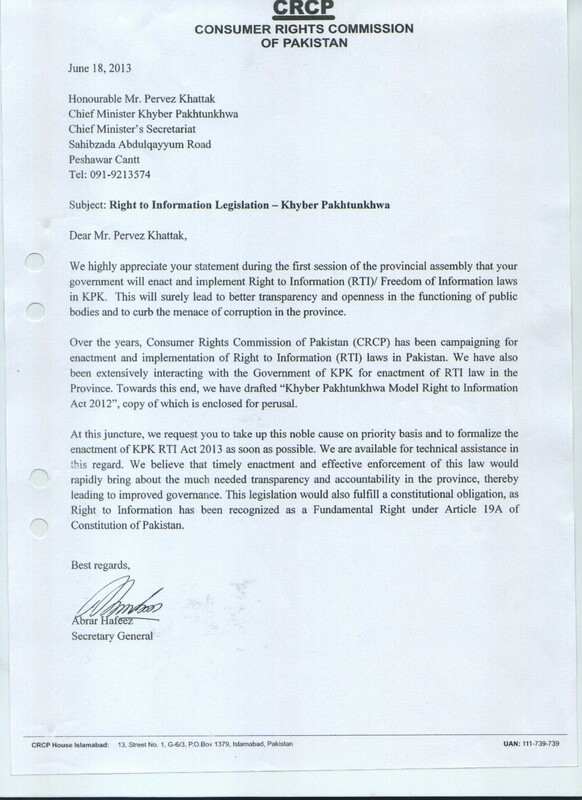 Consumers Rights Commission of Pakistan has pledged to make RTI law a success in Pakistan and is leading the campaign for RTI in the country. Driven by the considerations for access to information as a fundamental human right and a pre-requisite for good governance, CRCP’s employs both lateral as well as vertical approach in this field, which is both innovative and diverse and spans over last fifteen years. Starting with the establishment of an independent desk for the promotion of access to information, transparency and accountability in public and private sectors in 1998 CRCP built on its advocacy experience of the desk and launched a national campaign FOI-Pakistan in 2001. CRCP has been actively pursuing the promulgation of RTI law in the Federal Center and in all the four province of country. 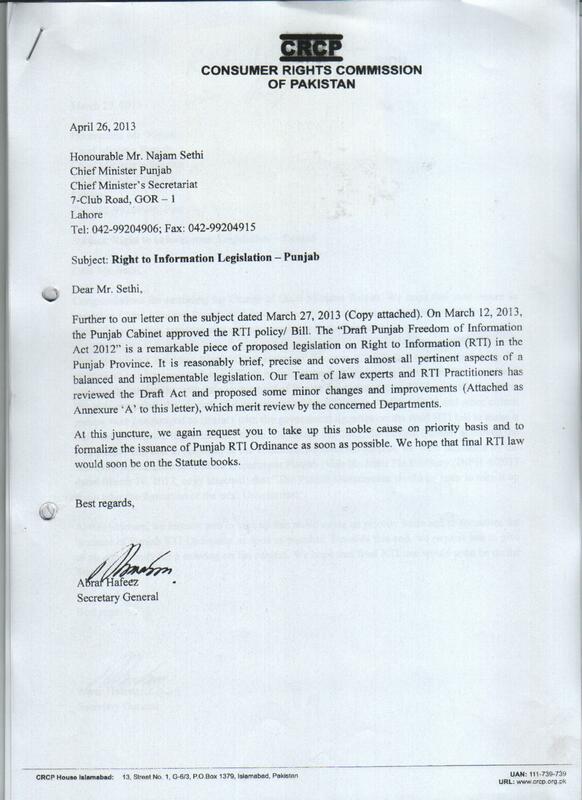 Its efforts have bourne fruit now with the promulgation of RTI Ordinance 2013 in KP. 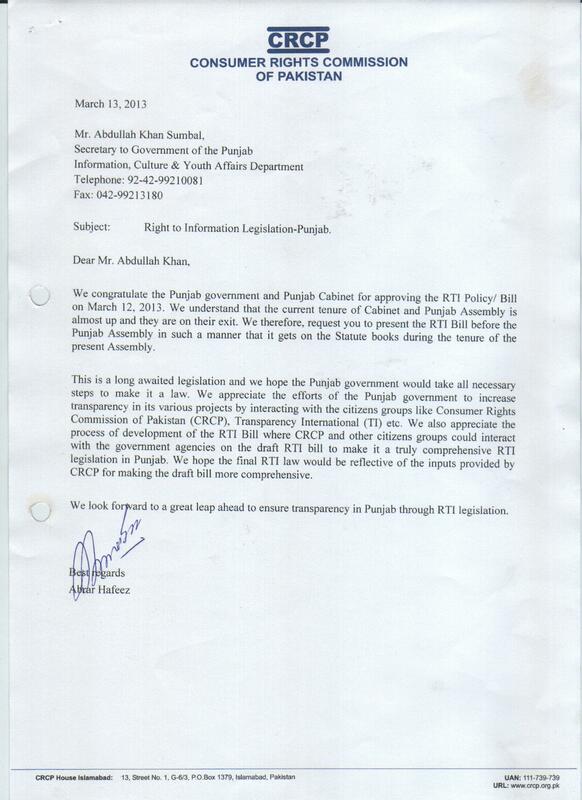 CRCP is also actively involved with both the Federal and Punjab Governments which are in the process of finalizing their draft RTI Bills. 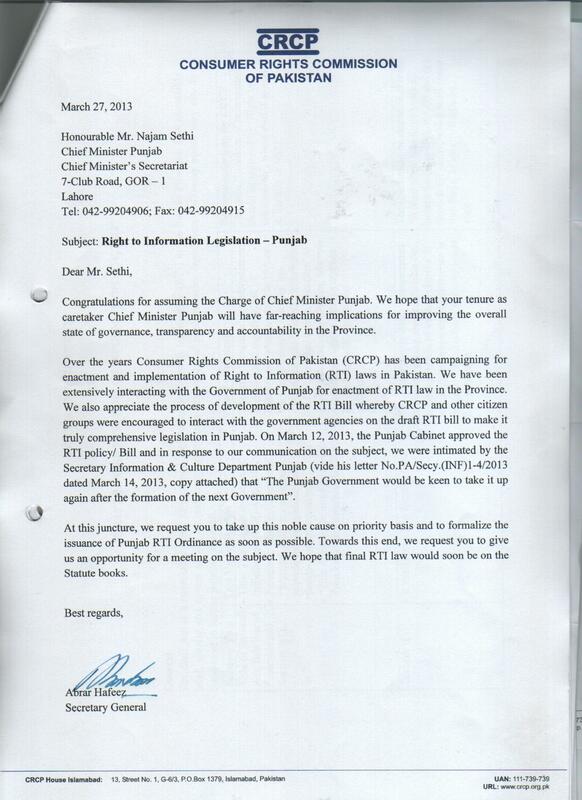 Campaigning for improvements in the existing RTI laws and their effective implementation is a regular feature of the activities of RTI-Pakistan. 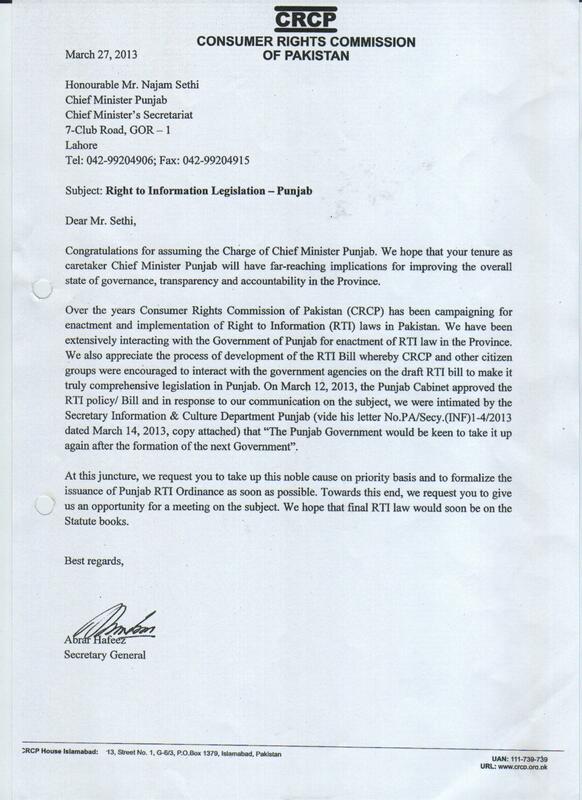 CRCP has undertaken many initiatives at the national, provincial and local levels including, but not limited to, advocacy for improvements in the existing RTI laws; submission of information requests; engagement with the Federal Ombudsman; preparation of model rules of business for FOI Ordinances; public awareness through seminars, walks, information materials, etc. ; preparation of training modules; capacity building workshops; assessment of the state of RTI in government departments; and advocacy to access laws in the provinces and district governments. An important initiative in this regard is CRCPs engagement with the Ministry of Law, Justice and Human Rights, Government of Pakistan. CRCP has also provided technical a assistance to the Ministry, under Access to Justice Program, for preparation of RTI policies for three important departments including the Establishment Division and its attached departments, Services and General Administration Departments (S&GADs) and also to the police departments.